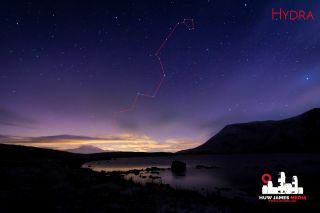 The slithering head of Hydra, marked in red, moves its way into the northern latitudes, seen here of the pristine lake of Llyn y Fan Fach in the Brecon Beacons Dark Sky Reserve in Wales, U.K.
Huw James is a science communicator, fellow of the Royal Astronomical Society and guest lecturer at the University of South Wales. Follow James on Twitter @huwmjames and keep an eye on his website for more info on his upcoming "Constellation Series" book. James contributed this article to Space.com's Expert Voices: Op-Ed & Insights. In the summer months it's hard to imagine the draining, bitter cold. In the mountains especially, the frost seeps past through your layers of clothes through your tingling skin and penetrates your bones. On the shore of Llyn Y Fan Fawr in winter, the skies are enchanting but enduring temperatures of 14 degrees Fahrenheit (minus 10 degrees Celsius) to get a good shot makes any photographer question his or her sanity. Llyn y Fan Fawr is Welsh for "lake of the big peak," at the foothill of Fan Brycheiniog in Wales. Its sister lake Llyn y Fan Fach comes complete with a "Celtic goddess," a ghostly figure that haunts the lake. From this Dark Sky Reserve in the U.K.'s Brecon Beacon National Park, many constellations leap out at you like the monsters they portray. The "water snake" named Hydra is a textbook example, slithering its way out from the underworld. Hydra is the largest of all the modern constellations and has a long history and star lore, which is complex and chaotic. It is now believed by Western cultures to represent a female water snake, with Hydrus in the Southern Hemisphere as its male counterpart. With Corvus and Crater upon its back, it sometimes shares stories with similarly reptilian constellations like Draco and Cetus, both long, serpentine creatures. It is now largely agreed that the most well-known star lore for this constellation follows the many-headed monster slain by the mighty Hercules in his 12 labors. As the creature terrorized the town of Lerna, Hercules tried to stop the nine-headed monster by slicing off its heads. Famously, any severed head of Hydra sprouts two or three more. But by cauterizing the blood with flaming branches and slicing off the immortal golden head of the beast, Hercules slew the beast for good. Though technically a Southern Hemisphere constellation, the constellation can be seen as far north as 54 degrees north of the equator. Many Messier and NGC (catalogs of deep-sky objects) objects lie within the boundaries of this huge constellation, a few as star clusters but some as impressive spiral galaxies. From the Northern Hemisphere you'll only really see M48, an open star cluster that can still be seen with the naked eye in clear, dark conditions. The other Messier Catalog objects in Hydra are farther south, named M68 and M83. The former is a stunning globular cluster that can easily be resolved through a medium-size telescope. The latter is a splendid barred galaxy (a spiral galaxy with a central bar-shaped structure) that can be made out in fairly good detail with a large telescope but can be seen with a pair of good binoculars. Other objects of note include the Ghost of Jupiter. A planetary nebula (NGC 3242) discovered by William Herschel that bears a resemblance to our solar system's largest planet. Also, two meteor showers are linked with this constellation: in early December the active Sigma Hydrids and in January the minor Alpha Hydrids. Hydra is a fulfilling constellation that almost spans the length of the night sky. It links people through history and geography and is worth looking out for. M68 - RA12h 39m 27.98s D-26°44'38.6"
Note: RA and D are Right Ascension and Declination, the latitude and longitude of the night sky.